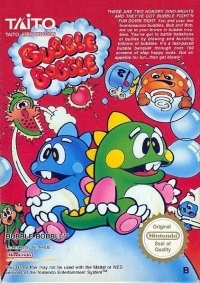 Box Text: THESE ARE TWO HUNGRY DINO-MIGHTS AND THEY'VE GOT BUBBLE FIGHT'N FUN DOWN TIGHT. You and your two brontosaurus buddies, Bub and Bob, are up to your brows in bubble troubles. You've got to battle battalions of bullies by blowing and bursting billions of bubbles. It's a fast-paced bubble banquet through over 100 screens of slap happy suds. Got an appetite for fun... then get blowin'. 07-31-2015 brodus Box Text THESE ARE TWO HUNGRY DINO-MIGHTS AND THEY'VE GOT BUBBLE FIGHT'N FUN DOWN TIGHT. You and your two brontosaurus buddies, Bub and Bob, are up to your brows in bubble troubles. You've got to battle battalions of bullies by blowing and bursting billions of bubbles. It's a fast-paced bubble banquet through over 100 screens of slap happy suds. Got an appetite for fun... then get blowin'. 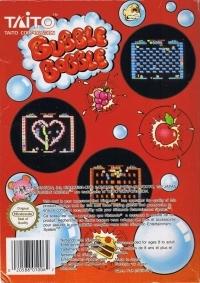 This is a list of VGCollect users who have Bubble Bobble in their Collection. This is a list of VGCollect users who have Bubble Bobble in their Sell List. 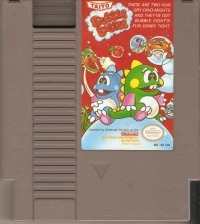 This is a list of VGCollect users who have Bubble Bobble in their Wish List.